You know, you do everything you can for your cats. Teach them right from wrong, nurture their little dreams and convince them they can be anything they want in life as long as it’s a cat. But sometimes, no matter what you do, your cats develop bad habits. Take Helen for example. No really, take Helen! Ba-dum. Ooops, that’s the script for my Catskills schtick. Disregard. Helen is in general a fine cat. She doesn’t cause too much trouble when she lumbers around the house, and mostly she just sleeps on her semi-firm pillow on top of the sofa. She tries to play gently with the kittens but if she gets a little rough they can easily get away from her because Helen doesn’t get worked up enough about anything to actually run. She’s not one to present us with hairballs and she keeps her nose, and paws, clean. Dan brought home a spanking new Double Wide Cat Scratcher last week, and all the cats not only scratched it but took turns sleeping on it. 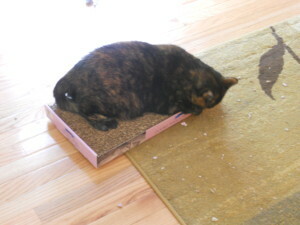 If our cats have a deep and abiding love for anything, it’s that scratcher. It is Helen’s new best friend. 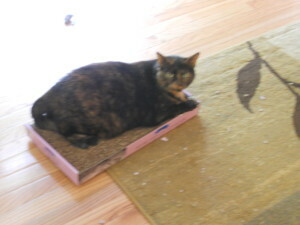 But the other day, as she was lounging on the scratcher, she started to, well, eat it. Well maybe not eat it so much as chew it up and spit it out. She goes to town on that thing, munching and spewing cardboard like there’s no tomorrow. And here is her “I really don’t give a damn that you caught me” look. Please just let me know if you see double wides on sale somewhere. I have a feeling we’re going to need to stock up. This entry was posted in Uncategorized and tagged Animals, Diet, Humor, Imagination. Bookmark the permalink. All our cats have been nuts for wire nuts. The ultimate super cheap skittering cat toy; pick some fat ones at the big box store! Damian actually eats cardboard, and both he and Cosmas love to chew on their scratcher. I only replace it when it’s pretty thoroughly shredded. Let me know when you find that sale! No point in trying to figure it out. Cats are just…well…cats. My cats do not like “bought” toys except for “da bird wand.” If money was spent they are not touching it. Now take a nice clean sock…. I’ll check for doublewides in my area! These are the first cats I’ve ever had who actually play with their bought toys. Of course they’re not above chasing a paper towel roll or bottle caps.